During my visit to the Excite All Stars camp in summer 2013, the facility was a blur of activity. Some campers finished up an Olympic games activity while others flocked to a snowball truck parked outside. All of the campers wore a smile and their laughter filled the gym, creating an atmosphere of irresistible joy. As I chatted with the Williams family, one fact became clear: they love working with these spirited campers. Husband-and-wife team Gerald and Penny Williams founded Excite All Stars in 2007. The summer camp began with 20 students and the program has grown every year since. With the help of community partners, Excite All Stars recently expanded into a new gymnasium. The new camp facility at Joe W. Brown Park Gymnasium houses the 150 children, aged 6 to 14, who currently participate in the Excite All Stars Summer Camp. While the camp is focused upon sports, counselors also offer cultural enrichment such as piano lessons. In the tech lab, lined with sleek Apple computers, campers can meet with college interns for tutoring. And in a creative use of the camp’s space, the gymnasium is divided into smaller “classrooms,” giving the students more one-on-one time with counselors. One goal of Excite All Stars is to fight childhood obesity by introducing campers to a variety of activities, from swimming to rock climbing. A full-body motion gaming area allows campers to exercise via video games. The teenagers have their own area in the camp (referred to lovingly as the “Cove”), where they learn about life choices and career options. In addition, the teenaged campers participate in an entrepreneurship program at Excite Café, where they cook pizzas, panini and more alongside professional chefs. The overall goal of Excite All Stars is to set a higher trajectory for these campers by inspiring them to achieve greatness. 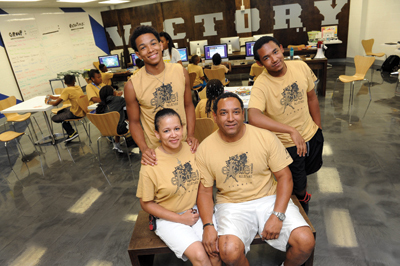 The Williamses want the program to continue growing and increasing capacity. A separate, permanent facility for the camp would also help. Even with aid from sponsors such as Nike and NORDC, they still had to turn away potential campers this year. Penny and Gerald Williams are quick to stress the importance of family in their success. In fact, their two sons have served as counselors since the camp’s beginning, and the entire family lights up when discussing their work. And the Williams family is more than capable of providing that spark. Excite All Stars welcomes community stakeholders, and donations to year-round programming are always appreciated. For more information, visit ExciteAllStars.org.